Small enough to fit in the palm of your hand, the DyNA Chill holds 12 x 1,5/2,0 ml tubes. Ideal for storage of enzymes and transporting of samples, this portable cooler requires no ice. Proprietary refrigerant in the sides , bottom and lid surrounds samples in cold. 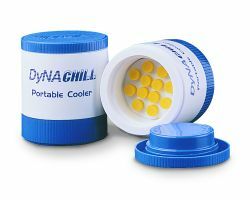 The DyNA chill is available in two versions , 0oC and -15oC. Both will keep samples cold for eight hours or longer.